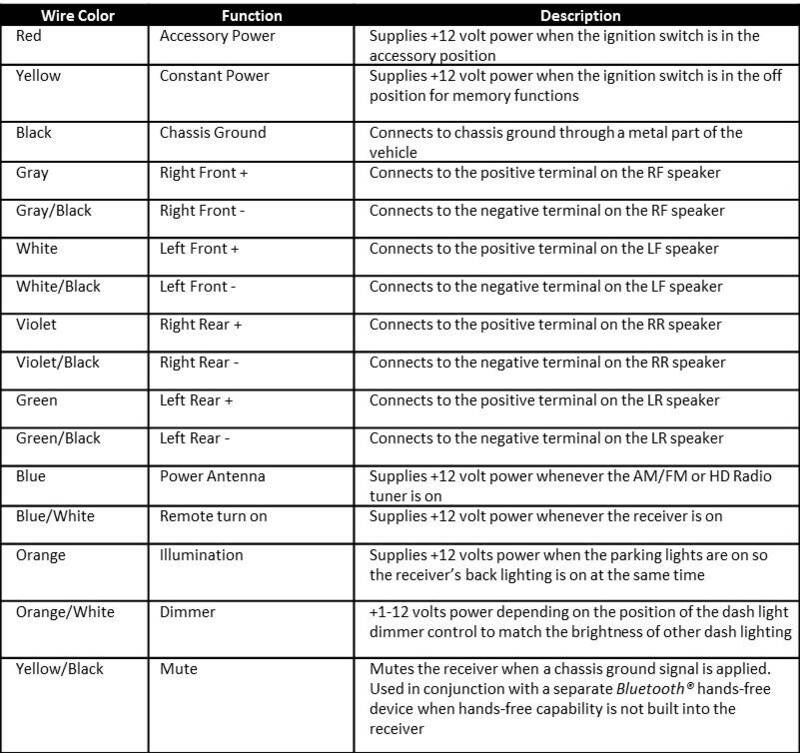 Get to know the connections that make your car audio system function properly. Understanding the different types of wires and connections that link car audio components to the car electrical system is important in any installation. Solid and accurate connections are necessary to ensure optimal sound quality and performance. A car electrical system is a direct current (DC) electrical system where current flow moves in one direction and in a circular path. The largest wires carry the most electrical current and are found at the battery, alternator, and starter. Large diameter wiring is also necessary for high-current products like amplifiers. •	Wire Size – Wire size is determined by the American Wire Gauge (AWG) system. The lower the AWG number, the larger the diameter of the wire. For example, a #4 AWG wire has a larger diameter than a #8 AWG wire. Make sure the wire has an AWG size so you can compare wire sizes effectively. •	Current Capacity - The larger the diameter of a wire, the more current it can carry. More powerful electronics require wires with larger diameters. Most battery cables in vehicles are #6 or #4 AWG. When more electronics are added to a car, the vehicle electrical system must produce, store, and deliver more current. The correct wire gauge is necessary to maintain proper operation of electronic devices. •	Return Path - DC electrical circuits have a ‘circular path,’ so every circuit needs a return path for the electrical current to complete the circuit. This return path can be a wire of equal gauge that connects to the negative post of the battery, or more commonly, to the metal chassis of the car, metal body panels, or both. The return path is often called the ‘ground’ or ‘chassis ground’ when applied to vehicle electrical circuits. The metal body of the car electrically connects back to the negative battery cable. For vehicles with fiberglass and non-metallic composite body panels, you must use the metal frame of the vehicle for the return path (if available) or run each negative wire back to the negative battery post to complete the circuit. In car audio systems, the largest diameter wires are used for external amplifiers because of their high current requirements. •	Positive (Power) Wire - The power wire connects directly to the positive post of the vehicle battery through a circuit protection device, like a fuse or circuit breaker. Connecting directly to the battery maximizes power delivery to the amplifier, which would be reduced if it were connected elsewhere, such as the vehicle’s fuse panel or ignition switch wiring under the dash. The power wire runs from the battery, to the circuit protection, to the amplifier location, where it connects to the amplifier’s positive (+) input terminal. This often requires running the wiring through the firewall, under the carpet, and to the trunk. •	Negative (Chassis Ground) Wire – Always use the correct size and current capacity of power and ground wiring by using the matching the same AWG sizes for ground wiring as recommended for power wiring. This ensures the amplifier has full capacity for current flow. Always connect the amplifier ground wiring to a solid metal part of the car using a crimped ring terminal placed at the end of the chassis ground wire. Secure it to the vehicle metal with a nut, lock washer and bolt. If a ground wire is too small to carry the required current or the chassis ground location is inadequate, resistance and heat will be created in the circuit. This can cause a drop in voltage supplied to the amplifier, which will reduce its power output and increase the temperature of the amplifier heat sink. The result is distorted sound from an underperforming amplifier. •	Low Resistance Wire - The preferred wiring for DC car electrical systems is Oxygen Free Copper (OFC) wiring. Copper is one of the best conductors of electricity – second only to silver. Low cost, inferior Copper ‘Clad’ Aluminum (CCA) wire is often included in amplifier kits. This is not actually copper, but rather aluminum which will not conduct electricity as well as copper. Aluminum is also more brittle (a particular concern for car wiring applications, given vehicle vibrations) and heats up faster than copper. Choosing OFC power and ground wiring ensures the best electrical performance conditions for all of your car electronics devices. •	Protect the Wiring - Any power wiring connected to the battery must have circuit protection. This is particularly true for high current amplifier power wiring. Always place a fuse or circuit breaker within 18 inches of the battery connection point to protect against a short circuit. For example, in a car accident, the high current power wire running through the firewall and under the carpet could become pinched and grounded out. If that happens, the fuse or circuit breaker will stop the flow of current and open the circuit, which will prevent the pinched wire from arcing, heating up and catching on fire. Fuse Facts: When using a fuse supplied in an amplifier wiring kit, the manufacturer determines the fuse size in accordance with the maximum amount of electrical current the wiring kit can support. Overprotecting the wire with a fuse that is larger than necessary is not recommended. If using bulk wire and your own connectors, purchase fuse holders and appropriately sized fuses to be safe. •	Determine Main Fuse Size –To determine the size, or current rating, of the main power wire fuse or circuit breaker located next to the battery (if it is not included in an amplifier wiring kit), add the current requirement of all amplifiers that will connect to the power wire. Include any amplifiers connected through a power distribution block splitting the main power wire. The current requirement will be listed in the amplifier owner’s manual or you can use the size of the amplifier’s onboard fuse (if present) to determine the current requirement. If using multiple amplifiers, add up the current requirements of each amplifier to determine the fuse size needed for the main power wire fuse. For example, if you have two amplifiers, each with a 40-amp fuse rating, place an 80-amp fuse at the battery connection. Audio signals start from the in-dash receiver output. Most car audio components connect audio outputs to inputs using preamp level signals delivered through RCA audio cables. •	RCA Audio Cables – These are cables with plug-in connectors that have red and white ends (red = right, white or another color = left). These connectors are used to connect the in-dash receiver and amplifier(s). Premium preamp level RCA audio cables feature gold-plated connectors and high-tech twisted pair design with shielded construction in the cable. The twisted pair design rejects unwanted induced noise along the path of the audio cable. o Running RCA Audio Cables - When running RCA audio cables in a vehicle, keep high current power wiring at least 6-8 inches away from RCA audio cables. This avoids a common problem—radiated noise from high current power cables located too close to the audio cable. If the cables are placed too closely together, an audible whine is heard through the sound system, which follows the RPM or revving of the engine. This unwanted sound is caused by a radiated magnetic field in the high current power wires. Separating the wires or using twisted pair RCA audio cables prevents radiated noise issues. o Connecting RCA Audio Cables - When you are ready to connect RCA cables to the equipment, match the red and white connectors to the same color jacks on the in-dash receiver or amplifier. Push the connector in and make sure the connection is solid. Red should be the right channel. White (or other color if not white) should be the left channel. Some brands use a red and black connector instead of red and white. Regardless of the colors used, cables must be connected to matching jacks on both products. Speaker wires are used when an in-dash receiver or external amplifier connects directly to speakers. This is the final connection that turns audio signals into sound. Every speaker installation requires either running new speaker wires or connecting to a vehicle’s existing speaker wiring. •	Running New Speaker Wire - In vehicles where no speaker wires exist, new wiring is required. The wiring must be able to handle a number of bends as it runs throughout the vehicle and should be multi-stranded copper construction of at least #18 AWG. Most speaker wiring is two-conductor wire that has been molded in a single cable. This wire construction allows both the positive (+) and negative (-) speaker connections to be made using a single cable. Two terminal (+) and (-) speaker connections apply to all speakers including coaxial speakers, upgraded component separates, and subwoofers so if the wire is not two conductor speaker wire, two separate single conductor wires must be run to each speaker, one wire for (+) and one for (-). During installation, connect the new speaker wire to the receiver or amplifier – whichever will be the audio signal source for the speakers – and run the new wire along the existing factory wiring channels to the location of the speaker. Be sure to make the correct connections, matching positive (+) and negative (-) at the speaker relative to the connections at the receiver or amplifier speaker output. •	Using Existing Factory Speaker Wiring – Using the existing factory speaker wiring will saves time and energy since it is already installed. When using pre-terminated wiring harness adapters for in-dash receiver installations, the adapter should connect into the vehicle’s existing factory speaker wiring where the connector was originally plugged into the factory radio. This is the easiest way to connect an aftermarket receiver to the factory speaker wiring. •	Adding a Subwoofer - If adding a subwoofer, avoid using factory wiring. Amplifier(s) and subwoofer enclosure(s) are typically mounted in close proximity. Running new speaker wire between the amplifier and the subwoofer saves time and increases the reliability of the connection. Pre-terminated wiring harness adaptors and connectors make aftermarket in-dash receiver installations a straightforward process. Simply purchase the harness for your specific vehicle and crimp or solder the connections to the wiring harness plug of the new receiver. Once the connections are made, the wiring harness is connected at the factory radio wiring harness plugs, just like factory-installed equipment. However, make sure the factory harness adapter has the correctly matched wiring colors on the other end connected the new aftermarket receiver’s harness. •	Matching Wires – Most in-dash receiver manufacturers conform to the Consumer Electronics Association (CEA) wire color code standards for receiver wiring. As a result, matching wires between the wiring harness adapter and the new receiver involves only matching the colors of the receiver harness to the same colors on the factory wiring harness adapter. Once connected together, the new harness assembly plugs into the factory wiring located behind the original factory stereo making the new receiver plug right in. Additional wiring will be necessary for all installations involving GPS, radio frequency signals (such as satellite radio or telematic services), or portable devices that have a data cable. Data cables are typically pre-terminated with easy plug-in connectors. Data cables are usually included with the product along with instructions on how and where to install them. An example of additional wiring is a GPS antenna for an in-dash navigation system, the satellite radio antenna for a Sirius XM satellite radio receiver, or the bottom dock connector cable that connects to an iPod adapter for stereo integration. •	GPS and Satellite Radio Antenna Guidelines - Do not install a GPS or satellite radio antenna in a location that requires it to sit under metal, as this could cause interference. The top corners of the dash (near the windshield) or under plastic panels high on the dash (near the windshield or side pillars) are ideal locations for satellite radio and GPS antennas. Some GPS or satellite radio antennas are intended to be installed on the outside of the vehicle, such as on the back portion of the roof or on the trunk because they require a metal ground plane to increase reception of the satellite signal. Always follow the manufacturer’s recommended instructions for these antennas. Getting all your car audio gear connected is not complicated if you take it one connection at a time. Remember these recommended practices, follow all installation instructions provided with the products and keep an eye on the details to enjoy aftermarket car electronics for years to come. Whether you are the Do-It-Yourself type or require the services of MECP certified professional installation technician, the quality and dependability of an installation is as important as the equipment and accessories you choose. •	Professional Installation - Many independent retail installation shops welcome jobs with products purchased at Amazon.com. Professional installers can also provide many of the installation accessories you need. Always look for a Mobile Electronics Certified Professional (MECP) installation technician to handle your most challenging installation needs or purchase installation on Amazon.com through an InstallerNet Card. •	DIY Installation - Research all of the necessary installation kits, wiring harnesses, and other items needed for your installation. For help, check out the installation tips in Amazon’s Installation Guides found in the Car Electronics Resource Center.